One of our most popular items is the Spiral Slicer. Unfortunetly, one of the most common complaints, we receive is, "The spiral slicer you sent me does not work, and is defective". From our experience, 99% of the time, the spiral slicer is not defective, but is working correctly. In most instances, we have found people not using the spiral slicer correctly. The instructions that are included with the item, are not the greatest. Please see the latest revision of the instructions sheet, to insure you have the clearest instructions. If that still does not help, please read on. There definitely is a "learning curve" when learning how to use the spiral slicer. It may seem hard at first, but keep trying, and you will get it. Just like riding a bicycle was hard at first... There are a few tricks to get the spiral slicer to work correctly. Hopefully after reading this article you will learn how to correctly use this amazing kitchen tool. The first area I will discuss is proper produce selection. First, only FRESH PRODUCE will work in this machine. Sorry canned, frozen or other processed produce will not work in the spiral slicer. There are only certain kinds of produce that will work in this machine. For example, a tomato will simply not work in this machine, and will make a mess. The most common produce items used in this machine are: Zucchini Squash, other types of squash (Italian, 8 Ball, Sunburst), Carrots and Beets. Has as wide as possible diameter, or "thickness". At least 1 inch in diameter. The larger the diameter, in general, the easier the item will be to spiralize. Produce that is fresh, and firm, not soft and mushy or old. 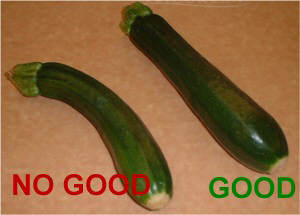 If selecting Zucchini Squash, select one that is a nice medium size. If zucchini gets too large, the seeds get very large, which tends to lead to poor results when using spiralizing. 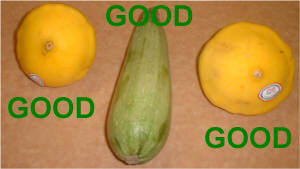 I have used other types of squash besides the popular zucchini squash, such as the sunburst squash, (the yellow squash in the picture to the left). Sunburst squash generally works fairly well, since they have a thick diameter. If they get too large, the seeds will generally hinder the spiralizing process. I have also used Italian squash, which is in the middle of the picture. 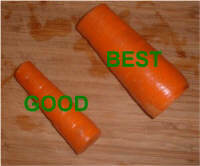 In the next set of pictures, I will show a carrot and carrot selection. Its important to select AS LARGE of a carrot as possible. 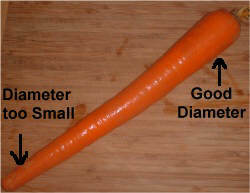 The carrot that I have selected is about 14" long! At the tip end, the diameter is very small, which will not work too well in the spiral slicer. The stem end, on the the other hand, has a much larger diameter, and is the end that should be used. Once you select the produce you will be using, you will need to cut it in a certain manner so it will work in the spiral slicer. You will want to cut vegetables no longer than 3.5 inches long. In addition, you want to cut the top and bottom end straight and flat so they can be held firmly in place by the spiral slicer. Think "like a log". You want to cut the produce to make it look like a log, and has two straight ends. You will also want to select the piece with the thickest diameter. 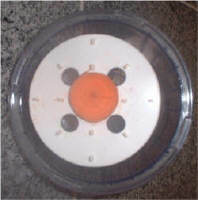 After you have the produce you will be using, you will need to place it on the spiral slicer. (See picture below to the left) . You will want to place the exact center of the produce as it stands upright on the exact center of the nub (also called center pin) on the spiral slicer. Once you have it in place, then gently push down on the produce, so it will "seat". Be careful not to touch the blades, since they are very sharp. Next use the selector switch on the side of the machine to make strips or slices. You can be sure you have selected the correct one by ensuring you can see the triangle (sharp) teeth point up as you look down at the cutting table. Next lock the top of the spiral slicer into place. You do this by placing the clear protective cover on top of the cutting table and turning it until it locks into place. The next step is to push gently down on the handle knob which will in turn press the pins in the holder into the produce you will be spiralizing. The next step is critical for proper operation. You will need to use two hands to operate the spiral slicer. I place my left hand on top of the clear protective cover, and hold it firmly in place. Next I take the palm of my right hand and place it on the center of the handle knob. 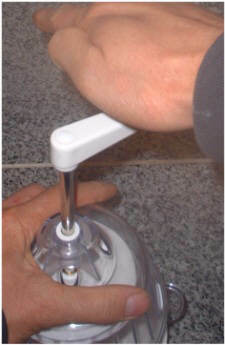 Next, start to turn the handle knob with the palm of your right hand WHILE APPLYING CONSTANT DOWNWARD PRESSURE on the handle knob. The previous step is critical for proper operation. I have found that if you do not use your palm of your hand to operate the handle knob, you are likely not to succeed in making long spirals. If you find you are making short strands, it is quite possible that you are not supplying constant downward pressure. When you apply constant downward pressure, you will have more contact time between the produce and blade, and thus making a longer strands. I have made zucchini strands that are longer than 6 feet long! Continue to apply constant downward pressure while turning the handle clockwise until you can no longer see stainless steel shaft above the clear protective cover. 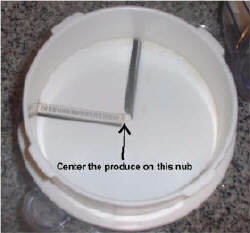 After you remove the clear cover, you should be able to look at the underside of the holder, and you will see a small bit of your produce that will be stull stuck onto the pins on the holder. 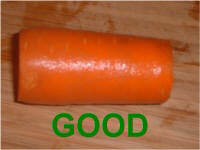 Here is the small piece of carrot that was left when I spiralized the carrots in this article. Finally you can remove the clear collection bowl, and you should be able to see the results. You should have a bowl full of long, thin strands. These strands can be used as garnish for salads, or plate garnish. Most times, I will spiralize a few zucchinis and make a pasta sauce out of tomatoes, sun dried tomatoes, bell pepper, and herbs and spices, which is delicious. I also enjoy spiralizing firm ENGLISH cucumbers (normal ones do not work as they have seeds) and adding a Asian style sauce. Hopefully with this article you have learned how to properly operate the spiral slicer. If it still does not work for you, please don't give up. Try different techniques to use the spiral slicer, and one may work for you. Once you find a way that works for you, stick with it! I experimented many, many times to discover the best way to operate the spiral slicer that I have shared with you in this article. 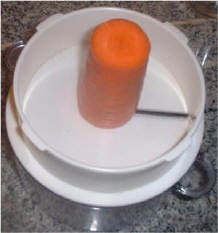 What can you do with pieces of produce that are left over after spiral slicing, such as the carrot round in the picture above? Many times, I will either blend it into the dressing, eat it while I'm still preparing the food, or cut it up and put it into a salad. What can you do with the smaller diameter pieces of produce that will not fit upright in the spiral slicer? I would recommend putting them in the spiral slicer long ways. Please see the picture below. While this will NOT make long strands, it will make some short strands and some nice garnish that still can be used. I recommend putting only small diameter pieces of produce on the spiral slicer in this way. 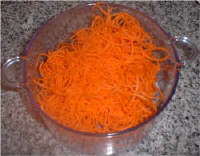 This is a picture of the leftover you will be left with when done spiralizing the long way. Using the spiral slicer in this method, will not yield as many shreds when compared to the suggested method. What is the difference between the Saladacco and Spiral Slicer? 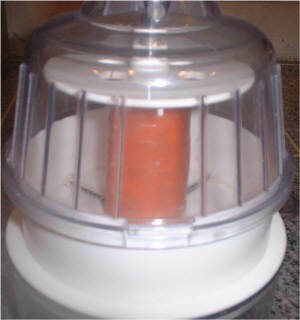 The Saladacco is the brand name of this spiral slicer shown in the picture in this article that was imported into the USA about 8 years ago from Japan. Since that time, they are no longer importing the "official" Saladacco slicer from Japan, and this slicer is now being manufactured in China. I have personally done a side-by-side comparison of the slicers, and for the most part are identical and operate in the same manner. Its like in the USA, when we say, "Can I have a Kleenex? ", and someone hands you a tissue for blowing your nose, even though, it may not be the "Kleenex" brand tissue.